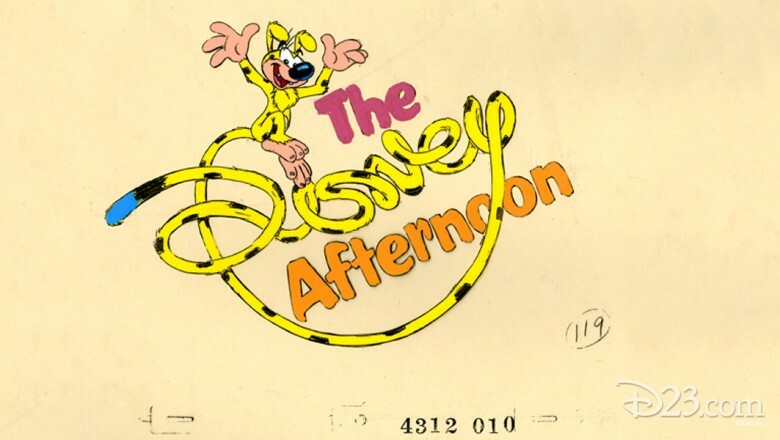 This ink-and-paint title cel from The Disney Afternoon television show line-up features the title character from Marsupilami, and is one of many rediscovered items from the Disney Television Animation archives. Press play below to listen to the fun-filled Disney Afternoon music theme! DuckTales featured Scrooge McDuck and the nephews, Huey, Dewey, and Louie. 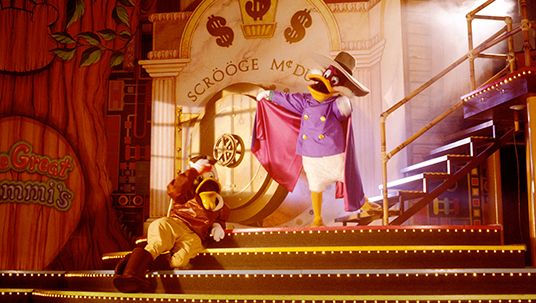 Scrooge’s innate sense for making or finding money leads him to outrageous adventures, accompanied by his grandnephews. While The Disney Afternoon officially ran from September 10, 1990, until August 29, 1997, Disney syndicated animation ruled the afterschool airwaves from 1987 until 1999. It’s hard to imagine, though, there was a time when Disney produced no animation for television. 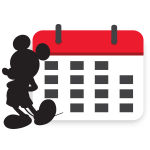 When new Disney CEO and Chairman Michael Eisner and President Frank Wells arrived in 1984, an early priority was setting up a division to produce television animation. Eisner had once overseen Saturday morning children’s television at ABC, and on his first day at Disney he mandated that the company have at least one animated series on the air by the fall of 1985. 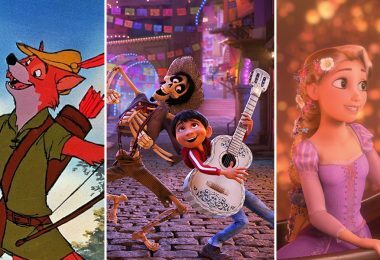 He called a small group of executives and creative personnel to his house the next Sunday morning, and they brainstormed ideas for the first wave of animated programs. Disney made its animated television debut right on schedule in fall 1985 with two programs, both on Saturday morning: CBS aired Disney’s The Wuzzles, and NBC aired Disney’s Adventures of the Gummi Bears. Gummi Bears are the mythical, medieval residents of Gummi Glen, who fight ogres led by the evil Duke Igthorn, to preserve their homes. These early programs, and the ones that followed, were produced on a higher budget than other animated programs on television at the time. 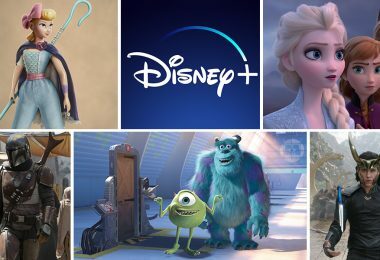 It was considered important that the Disney name not be applied to sub-par animation, and while the shows didn’t match the quality of theatrical features, they were far more polished than other television productions. We can’t go on television and look like trash. 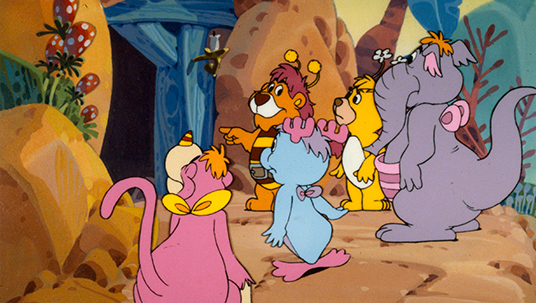 This odd group of characters on The Wuzzles, each two animals in one, living on the Isle of Wuz, created for a 1985 television series. Names included Bumblelion, Eleroo, Hoppopotamus, Moosel, Rhinokey, and Butterbear. Narrated by comedy legend Stan Freberg, The Wuzzles featured a cast of mixed-up creatures called Wuzzles and told of their adventures on the Isle of Wuz. Each character was a combination of two animals; for example, Bumblelion (a lion crossed with a bumblebee) or Eleroo (an elephant mixed with a kangaroo). The show spawned a line of cuddly toys from Hasbro but lasted only 13 episodes. 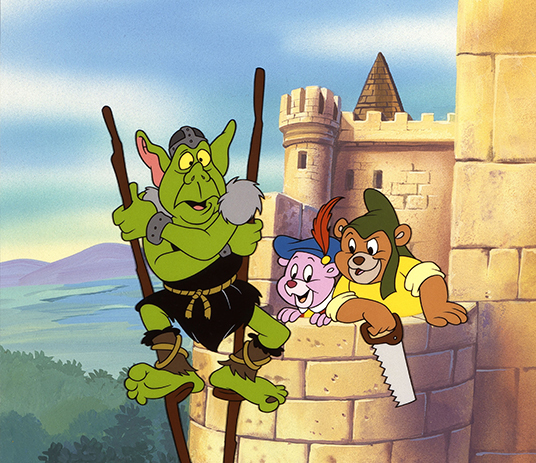 More successful was Disney’s Adventures of the Gummi Bears, which spent 5 seasons on NBC (1985-89) and ABC (1989-90) before it became a founding member of The Disney Afternoon lineup in 1990-91. The show centered on six bears—Zummi, Gruffi, Grammi, Tummi, Cubbi, and Sunni—who lived in Gummi Glen and battled the forces of evil Duke Igthorn with the help of magical Gummiberry juice. 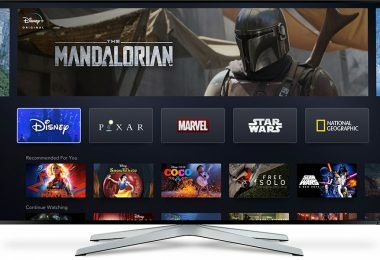 The show had an unusual inspiration, though; it came about when Michael Eisner’s son returned from camp begging for the popular Gummi Bear candy. Recognizing a popular trend, Eisner ordered a series to development based on the candy. 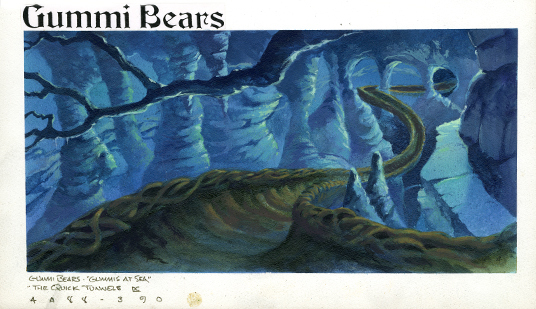 The Quick Tunnels allowed the Gummi Bears to move quickly from one location to another under ground. This background art, rediscovered in the Television Animation archives, shows one of these Quick Tunnels. Disney first blew the doors off of syndicated afternoon television with its greatest hit, DuckTales, which premiered in September 1987. 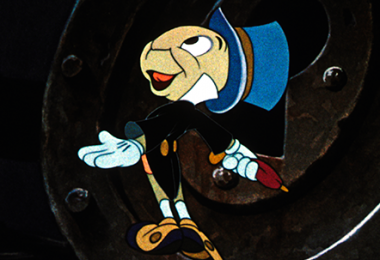 It would run for four seasons—and 100 episodes—until 1990, becoming Disney’s most prolific animated program. It would even spawn a theatrical spinoff, DuckTales the Movie: Treasure of the Lost Lamp, which was released in August 1990. Taking its cue from the classic Disney Duck comics by master artist and Disney Legend Carl Barks, DuckTales followed the adventures of Scrooge McDuck and his three nephews Huey, Dewey, and Louie. 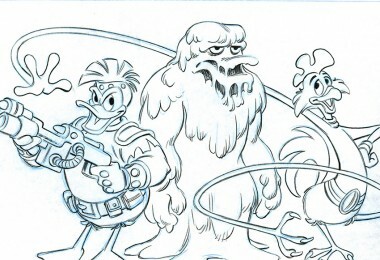 It also added new characters to the Duckburg lore, including young Webbigail Vanderquack, nanny Mrs. Beakley, and pilot Launchpad McQuack. 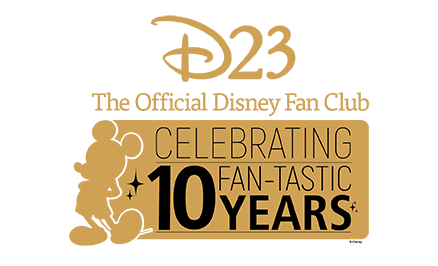 The timeless nature of the Barks characters—George Lucas and Steven Spielberg have cited their adventures as a major influence on Raiders of the Lost Ark—helped make the show a massive hit, and it set ratings records for its timeslot. It proved a huge success overseas as well, becoming the first American cartoon to be shown in the former Soviet Union in 1991. In 1989 DuckTales was joined in afternoons by a new show, Chip ‘n Dale Rescue Rangers. Originally intended to center on a team of crime fighters led by a mouse called Kit Colby, the concept eventually evolved to focus on veteran Disney chipmunks Chip and Dale, and their teammates Gadget Hackwrench, Monterey Jack, and Zipper. Their adventures lasted 65 episodes from 1989-1990. The chipmunks are leaders of a secret international organization devoted to tackling unsolved mysteries and mysterious oddball crimes. Other members of the Rangers are Monterey Jack, Gadget, and Zipper, and they battle Fat Cat and his cohorts. For the 1990-91 season, Disney created The Disney Afternoon, a two-hour block of afternoon programming. The initial lineup included existing shows Disney’s Adventures of the Gummi Bears, DuckTales, and Chip ‘n Dale Rescue Rangers, along with newcomer TaleSpin. For the next nine years the Disney Afternoon lineup would change annually, with a new show typically debuting each year. Once The Disney Afternoon was established, the hits just kept coming. TaleSpin utilized many characters from the classic film The Jungle Book to tell a new story set in the 1930s-era city of Cape Suzette. Baloo the bear was cast as a pilot, whose air cargo business is taken over by ambitious businesswoman (err… businessbear?) Rebecca Cunningham. He takes on young Kit Cloudkicker as his navigator, and faces off with a variety of air pirates and other ne’er do wells. 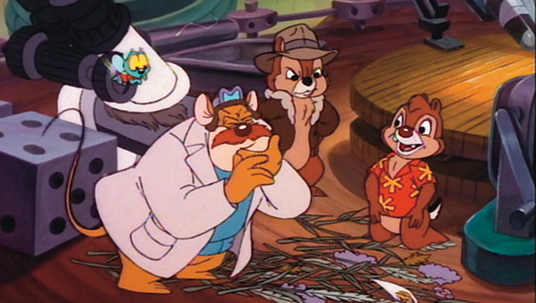 Cape Suzette provided the fictional city for TaleSpin and its exotic animal residents. 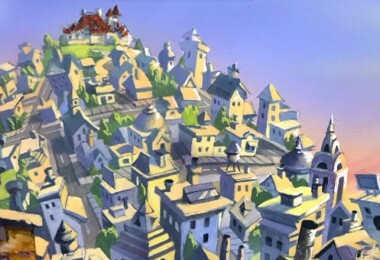 This background art, rediscovered in the Television Animation archives, provides the perspective of the city from one of the planes on its way in to dock. Originally proposed as a show called Double-O Duck, starring DuckTales favorites Gizmoduck and Launchpad McQuack as wannabe spies, Darkwing Duck eventually took its cue from pulp superheroes like The Shadow. 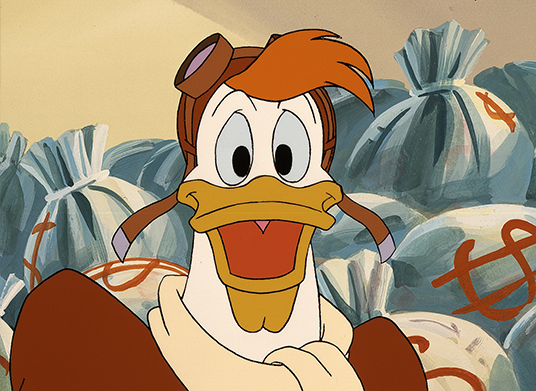 Running for 91 episodes from 1991-95, the show followed the exploits of superhero Darkwing Duck, his alter ego Drake Mallard, and his sidekick Launchpad McQuack, as they battled crime in the city of St. Canard. 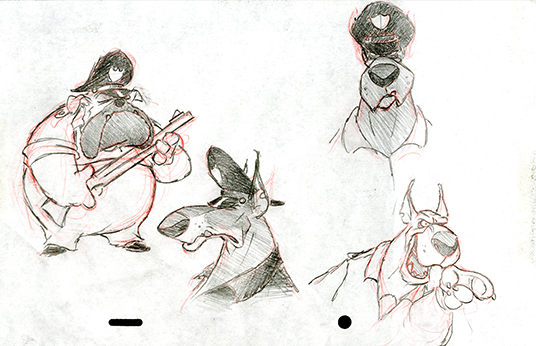 This concept art, rediscovered in the Television Animation archives, has an artist’s ideas for the villains that Baloo and his friends would encounter in TaleSpin. As the years went by, new shows were produced based on classic Disney characters, such as Goof Troop (1992-93) and Quack Pack (1996). Others, like Aladdin (1994-95) and The Lion King’s Timon and Pumbaa (1995-99), continued the adventures of characters from popular current films. And, of course, there were shows based on original concepts, such as Bonkers (1993-95) and The Mighty Ducks (1996-97). One particularly popular original program from the later years of The Disney Afternoon was Gargoyles, which ran for three seasons from 1994-97. A darker and more mature offering than other Disney shows, Gargoyles included deeper plots and a more involved continuity arc than typical afternoon programs. 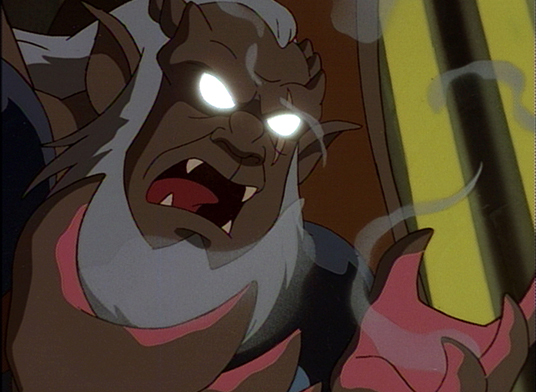 The show’s lore focused on creatures called gargoyles, which had been frozen in stone in medieval Scotland only to be revived in modern day Manhattan. Awaking at night, they combat human and supernatural threats while exploring a number of mythical and legendary themes. The show, although long since cancelled, has grown a sizeable cult fan base over the years and remains a favorite today. A darker and more mature offering than other Disney shows, Gargoyles included deeper plots and a more involved continuity arc than typical afternoon programs. The shows of The Disney Afternoon proved a huge success, and spawned a number of further adventures in the pages of comic books, Disney Adventures magazine, and a variety of computer and video games. Over the years several comic lines have been published based on DuckTales, Chip ‘n Dale’s Rescue Rangers, TaleSpin, Gargoyles, and more. The video games proved so popular that Capcom’s 1989 release of DuckTales for the Nintendo Entertainment System was completely remade as DuckTales: Remastered for release in 2013 on a number of platforms. The characters even made their mark on the Disney parks; Duckburg and the DuckTales characters came to Walt Disney World’s Magic Kingdom with the debut of Mickey’s Birthdayland in 1988 (which later became Mickey’s Starland in 1990). A stage show called Mickey’s Magical TV World, based on The Disney Afternoon shows, would be performed there regularly from 1990-96. With the introduction of Darkwing Duck on the Disney Channel in 1991, the character was later added to Mickey’s Magical TV World. Disneyland played host to Disney Afternoon Avenue in 1991; in this themed area near it’s a small world, guests could meet with popular characters from their favorite shows. Two attractions were re-themed for the occasion as well – the Motor Boat Cruise became the Motor Boat Cruise to Gummi Glen, and the Fantasyland Autopia became Rescue Rangers Raceway.